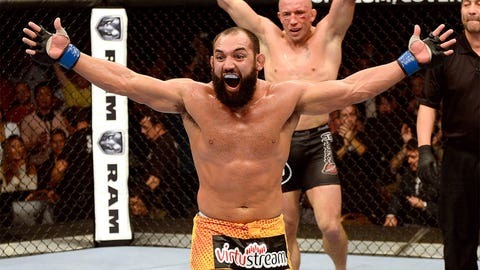 Johny Hendricks doesn't care about GSP, he just wants the gold. They say Disneyland is the happiest place on Earth, but the old advertising slogan reached new heights last Friday when UFC welterweight Johny Hendricks just happened to be there vacationing with his wife and kids when he received an impromptu call from UFC president Dana White. The call didn’t take long – Georges St-Pierre is taking an extended break from the sport and he’s giving up the title so a new welterweight champion will be crowned as Hendricks will face Robbie Lawler at UFC 171 in Dallas on March 15 with the belt on the line. It was great news for Hendricks, who had been sitting in limbo since his controversial loss to St-Pierre in November at UFC 167. Everybody in the world was telling Hendricks he clearly won the fight, but he didn’t have the title and his record read loss after the judges rendered a mind-boggling decision. Now he will get another chance to wrap the gold around his waist, except he’ll face Lawler instead of St-Pierre in March. Despite what some may think, Hendricks really didn’t care about beating St-Pierre. It was always about getting the title so the fact that he’s still competing for the belt in March is all that matters – the opponent he’s facing is just the guy trying to take the title away from him. It was never GSP, it was what he carried around to every press conference. "It was never GSP, it was what he carried around to every press conference," Hendricks told FOX Sports on Monday. "Now I’m getting to fight for it again against another tough opponent. Who wouldn’t be happy? I’m just grinning ear to ear, so excited that Mr. White and the Fertitta brothers they gave me another opportunity at. That’s my whole thought process – I’m very grateful and very thankful another opportunity." St-Pierre taking a leave of absence doesn’t concern Hendricks one bit at all. Of course in the back of his mind, he would always love the chance to avenge the controversial loss on his record, but the Canadian’s return holds no consequence in how he will carry himself as champion, and it won’t haunt him for the rest of his career. It was a fight, the fight’s over, and now Hendricks has moved on. "Yeah, I’d like to redeem that because it is questionable, but here’s the thing – would I want to fight myself again? That’s what I keep asking myself, you just don’t know. Who’s to say in a year’s time he might get bored, he might want to fight again, so I need to make sure I’m ready, have the belt in my hand and ready to face him," Hendricks said. "If he doesn’t come back, he doesn’t come back. It was never about him, it was about that belt. I’m getting another shot at it and that’s all I’m thinking about." The second Hendricks heard that he was fighting for the UFC welterweight title, elation set in, but there was still a small curiosity about who he’d be facing for the belt. When he heard the name Robbie Lawler, Hendricks was a little bit surprised. GSP, I was never worried about his stand up. He never hurt me, he never made me where I was threatened. At the time, Hendricks expected the other name on the marquee to read Carlos Condit, but in reality he didn’t care if White told him he was facing Godzilla on March 15 in Dallas, he would have been just as excited. "A little bit I was, but like I’ve been everybody that’s above my pay grade," Hendricks said about Condit not being his next opponent. "I say yes sir, thank you for the opportunity and move forward. When they announced that it was Robbie Lawler my first thought was ‘wow this could be a fight that everybody remembers’. "I think it’s going to be a fight to remember." Hendricks will spend the holidays with his in-laws next week and then it’s right back into training camp where the preparation will begin for Lawler. In many ways, Hendricks is looking at Lawler as a much more dangerous opponent than St-Pierre because he has the ability to end the fight in one second. Admittedly, Hendricks didn’t carry that same fear into the fight with the now former UFC welterweight champion. "GSP, I was never worried about his stand up. He never hurt me, he never made me where I was threatened. I know with this one, I have to be more aware," Hendricks said. "With GSP I could be a little bit more careless because I knew nothing was going to be where I was going to lose everything with one punch knockout power where as Robbie has that. You have to be aware. If you make a mistake he has the power to knock you out." Now begins Hendricks’ second march towards the title and the timing worked out perfectly with another part of his pre-fight rituals. Last Friday as he was on vacation with his family, Hendricks shaved like he would normally do when there isn’t a fight approaching – just then he got the call from Dana White. In other words, the beard is coming back soon. "I shaved on Friday and you end up getting the call," Hendricks said. "I was like what better timing could that have been and now you have a fight. Sweet!"